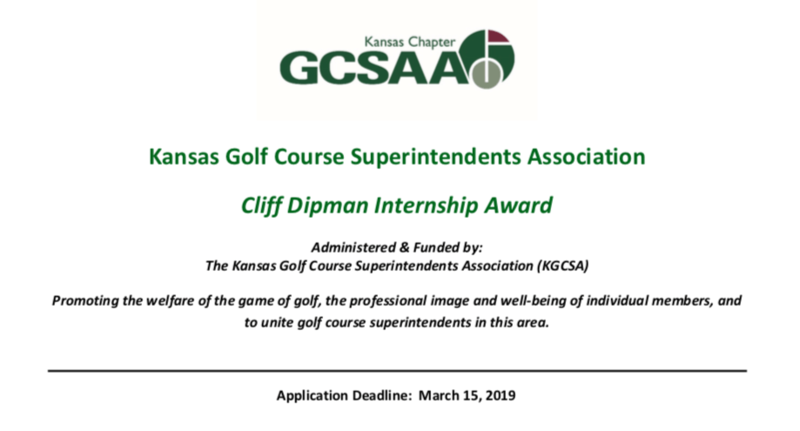 ***Update: The KGCSA voted at their board meeting yesterday to include an internship (either at Rocky Ford or in Olathe) to be included in the Cliff Dipman Internship Award. The KGCSA Cliff Dipman Internship Award consists of two $2,000 awards to Kansas State University students working at a golf course whose superintendent is a member of the KGCSA. One will be directed to a student doing an internship at a 9-hole golf course or working at one of the K-State Research Centers (Rocky Ford in Manhattan or in Olathe), and one doing an internship at an 18-hole facility. Applications will be reviewed by the KGCSA Board of Directors. All decisions of the committee will be final. Applicants will be notified of their status by March 30 of the year submitted. • Must already be enrolled in a 4-year undergraduate turfgrass program at Kansas State University. • Must intend to complete a 3- or 6-month internship at a golf course in the state of Kansas whose superintendent is a member of the KGCSA, or work at one of the K-State research stations (Manhattan or Olathe). • One award will be available for a 9-hole intern (or at one of the K-State research stations in Manhattan or Olathe) and one for an 18-hole intern. • Return completed application to: KGCSA Awards Program, 1712 Claflin, 2021 Throckmorton, Manhattan, KS 66506 or cdipman@ksu.edu by March 15, 2019. • Applications can be downloaded from the KGCSA website, found here. Cliff Dipman was the Golf Course Superintendent at Manhattan Country Club for 32 years. He has served as a mentor to countless students who have become successful golf course superintendents in Kansas and across the United States. Year after year, Cliff recognized the importance of the internship in complementing academics. Congratulations to Dave Fearis on being named one of the recipients of the Col. John Morley Distinguished Service Award from the Golf Course Superintendents Association of America. Here is a link to some detailed information about the award, and some photos of Dave. Dave was the superintendent of Blue Hills Country Club in Kansas City for many years. He has been a leader in the profession, serving locally, regionally, and nationally. Dave has been active in the Heart of America Golf Course Superintendents’ Association and First Tee of Kansas City. At the national level, he served as GCSAA President and he also worked several years as the Director of Membership, where he emphasized professional development for both superintendents and assistant superintendents. Anyone who knows Christy knows that she shines in all of these areas. Most of you who read this blog know Christy primarily from the turf world, but she is an excellent colleague for those of us who also work with other commodities as well.